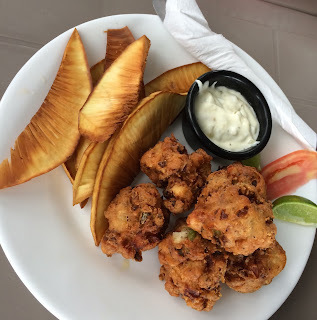 I was in a Mexican restaurant with a friend who had asked for a recommendation, and I had indicated an item on the menu as being a notably special Mexican dish. Little did I realize that the English version of the menu spelled it out as "Nogada Chili". 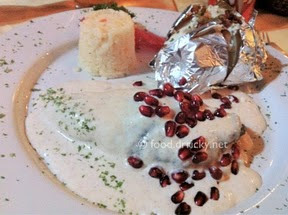 I was, of course, recommending the dish chiles en nogada, an appropriately festive dish. A more appropriate translation would be stuffed chile peppers in walnut sauce. The classic interpretation involves stuffing a roasted poblano pepper with a sweet and spicy pork mixture, then serving the whole thing covered in a walnut sauce, and sprinkled with pomegranate arils. As the elements of pizza margherita pay homage to the colors of the Italian flag, the components of chiles en nogada call forth the chromatic unity of the Mexican flag: the green of the poblano, the white of the walnut sauce, and the red of the pomegranate. The dish is genius in it's unity of disparate flavors, and by no means easy to put together: the walnut sauce alone requires one to blanch the walnuts and rub out the thin brown skin so that the resulting sauce is pure white. And so creamy as to feel like melted ice cream on the tongue, complemented by the subtle heat of the pepper, and punctuated by the tart crunch of pomegranate. I should imagine that the relatively simple color schemes of the Canadian, Polish and Japanese flags would inspire dishes of tasteful and colorful unity, but I am unaware of any others.